The federal government in Brazil is interested in extracting uranium and phosphate in Ceará, the Anti-nuclear Network together other EJOs are concerned about health and environmental risks. The project has not started. In 1976 a mineral deposit of uranium was discovered in the municipality of Santa Quitéria, State of Ceará. In 2006, the federal government shows interest in exploring the deposit. By this year (2016), the aim of the Brazilian Nuclear Industries (INB) was to extract uranium and phosphate (for the agroindustry). As well, in accordance with the Government of the State of Ceará, the uranium will be use for the nuclear energy plant in Rio de Janeiro (Angra III). In 2009, Brazilian Nuclear Industries and Galvani (Brazilian enterprise) created the Consortium Santa Quitéria for the investment of the project called Mina de Itataia; Yara (Norway) joined the group. This mine is the largest reserve of uranium in the country and its economic viability depends on the associated phosphate exploration. This means that the uranium extraction is subject to the production of phosphoric acid-raw material used in the production of fertilizers (agroindustry). By the end of 2008, rural communities with support of the University of Ceará, agrarian and environmental justice organization such as Vía Campesina, the Brazilian Network of Environmental Justice, others local EJOs, and a religious group start a platform for opposing to the mine, the main causes were the high level of health risk, the high level of water use (according with other similar mines is around 1.150.000 liters per hour) in a water scarce zone. In 2011, the accident in Fukushima strengthened the Santa Quitéria communities. 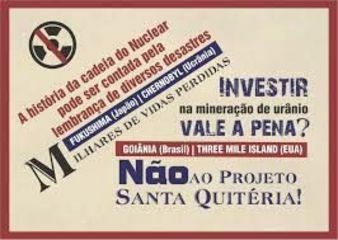 The same year they created the Articulação Antinuclear do Ceará (Anti-nuclear network in Ceará) to debate around the possible risks, social and environmental impacts of the mine. This Network helped the mobilization of communities directly affected by the mine and is associated with the Articulação Antinuclear Brasileira (National Network against Nuclear Energy). As part of the Environmental License required, the IBAMA (Brazilian Institute of Environment and Renewable Natural Resources) called for public audiences to explain the project and offer different types of benefits (work, development, roads, etc..). However, the works have not even been initiated due to lack of environmental license. Several master thesis coming from the University of Ceará have analysed the potential environmental risks and rights of the project based on the environmental impact assessments produced by INB and Galvani. According to the activists, these analysis were sent to IBAMA, public prosecutor offices, and to a human rights office in Ceará. In September 2016, according to the activists, IBAMA has issued a technical advice against the project. The document would indicate issues like the hydric non-feasbility, lack of mitigation measures in case of radioactive contamination by nearby communities, and lack of government agencies' green light for the project. This technical advice, however, has been held at the IBAMA's executive board ever since. The environmental agency has not officially spoken about the issue yet. Because of these last events, social movements, NGOs, scientific networks and others jointly organized a campaign in March 2017 entitled "Anti-nuclear Ceará: in defense of life, water, and towards environmental justice". Coordinated by the anti-nuclear network in Ceará, a open letter was written to IBAMA asking the environmental agency to overrule the environmental license process and calling for national and international support on this quest. The letter summarizes the project's potential risks and impacts, denoucing some irregularities, also. "Four concentraded uranium loadings per year are planned to happen, via highway networks, to Mucuripe Port (Fortaleza). However, in the environmental impact assessment and envirommental impact report (EIA-RIMA, from the acronym in Portuguese) there isn't a safety transportation plan and the capital city of Fortaleza is not included in the report". 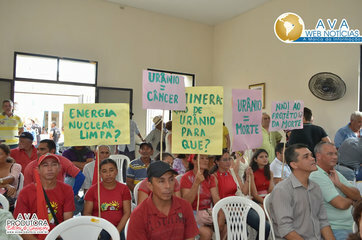 The denounce continues pointing that "Fortaleza inhabitants and the overall populations living along the roads through with the radioactive loadings are going to be transported remain not aware about the project existence and have not been included in the project's discussions regarding the risks and impacts they are potentially facing in the future". Project Details The mineral deposit of Santa Quiteria has geological reserves of 142,500 tons of uranium associated with phosphate. The mineable reserve is 79.5 million tons. It will bring between 1000-3000 work posts (direct and indirect). Why? Explain briefly. The project remains stopped. And there is a strengthening of participation and national networking, such as Articulação Antinuclear do Ceará (born under the struggle for this project). As well, the increasing knowledge in the rural communities about nuclear energy and its possible risks. RIMA - RELATÓRIO DE IMPACTO AMBIENTAL PROJETO SANTA QUITÉRIA - CE FEVEREIRO/ 2014 Environmental impact report produced by Santa Quitéria Consortium (Feb./2014) and submitted to IBAMA. CAMPANHA CEARÁ ANTINUCLEAR: EM DEFESA DA VIDA, DA ÁGUA E POR JUSTIÇA AMBIENTAL Open letter produced by the Anti-nuclear Ceará campaign in defense of life, water and towards environmental justice. It was sent to IBAMA claiming to overrule the project's environmental license process. Reforma agraria sim, uranio não!